Efficiently manage your email, calendar, contacts, and tasks. Push email support keeps your inbox up to date. Conversation view groups related messages and calendars, allowing the operator to view both programs side-by-side. With Outlook 2016 Planning your schedule has never been easier. Create and share professional-looking documents with state-of-the-art editing, reviewing, and sharing tools. The new Design tab provides quick access to features, and Smart Lookup shows relevant contextual information from the web to your document. Create, collaborate, and effectively present your ideas,with new slide transitions and an improved Animations task pane. Threaded comments alongside your slides help you incorporate feedback into your presentations. This program mimics the properties of a notebook, allowing you to keep notes, ideas, web pages, photos, even audio and video clips all in one place. Whether you’re at home, in the office, or on the move, you can take it with you wherever you go, while sharing and collaborating with others. Microsoft Office Home and Business 2016 takes the work out of working, by interacting to provide much-needed focus, wherever it goes. This suite comes with the 2016 versions of Word, Excel, PowerPoint, OneNote, and Outlook featuring enhancements that help you create communicate and work from just about anywhere. Perfect for remote workers and dispersed teams, Office 2016 lets you edit and co-author in real time, send documents fast and stay in touch via Skype. There’s no better software suite for businesses that need full access on the go. In addition to cutting-edge productivity based applications, customers are granted access to file storage in OneDrive. This feature helps to free up hard drive space and improve your cloud-based organization. Additionally, free Skype World Minutes help you keep in touch with your team. Purchase includes a single-user Windows version of Microsoft Office Home and Business 2016 that can be instantly downloaded and installed when you buy it from My Choice Software. Take advantage of our volume discounts to save even more on this product. Sign into Office 2016 and use OneDrive, to quickly access recent documents on any device with seamless integration. Microsoft Office Home and Business 2016 (all languages) help’s you to maximize productivity at home and in the office. This edition of office includes all of the great programs you need to streamline your working process, including Outlook to manage your emails and calendars from one location. 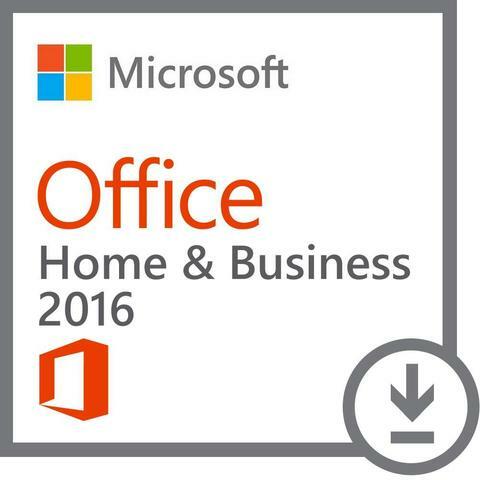 Office Home and Business 2016 is great software to fulfill your basic needs for your computer at home, or at work. Need help selecting your software? Give us a call at 800-318-1439, and we will be happy to help.